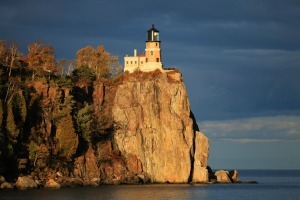 Park Naturalists Kacie and Kelsey share their top stops at Split Rock Lighthouse State Park. 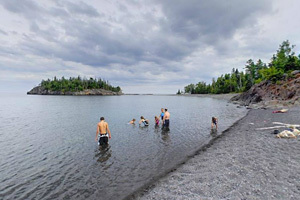 Pebble Beach offers either a refreshing dip in Lake Superior or an incredible array of flat stones for skipping on the water…you decide which is more to your liking! It’s also a wonderful place to test your kayak skills in a protected cove (but you’ll need to bring your own kayak). Picnic sites are tucked just beyond the treeline, and the beach is a short walk from parking and the Trail Center building. For a map of the park, click here . It’s one of the most visited lighthouses in the nation and a favorite backdrop for photos. The lighthouse was in service as an aid to navigation from 1910 to 1969, and the main dock and boathouse for the station were once located here. The lighthouse site is maintained by the Minnesota Historical Society and includes the Fog Signal Building, three keeper’s houses and the Visitor Center. Tours of the sites are available daily through the summer season for a fee. Find more info here. For recommendations of where to snap the best pic of the lighthouse, check with the Minnesota Historical Society here. The Gitchi-Gami State Trail winds through the park. You’ll pass near Middle Falls waterfall and spot parts of the Upper and Lower Falls as well. There are many beautiful overlooks between the park and Twin Points Public Water Access, a short distance away. 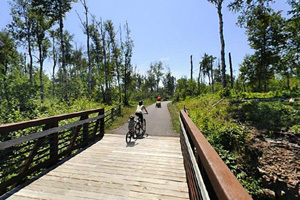 For a longer trip, start at the park and head 8.5 miles south to Gooseberry Falls State Park. Stop at Thompson Beach for stunning panoramic views of Lake Superior. This video offers a quick overview of the ride. For a map of the trail and additional info, click here. On the east side of the Split Rock River Loop Trail, you’ll find this location overlooking Lake Superior and the river valley. There is a small trail shelter where you can relax and enjoy the magnificent view! Explore as much of the trail as you’d like (or your schedule allows). 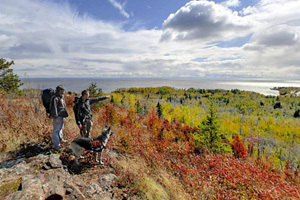 The Split Rock River Overlook connects with the Superior Hiking Trail that stretches along the North Shore, from Duluth to Grand Portage. Along with stunning scenery, you’ll find historic stops throughout the park. Remnants of the small fishing village Little Two Harbors can be seen as well as evidence of logging from the early 1900s. Join park naturalists on tours for a little history and a little exercise! 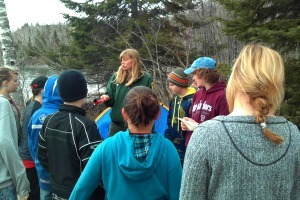 Be sure to check out the popular programs about Lake Superior shipwrecks. In 1905 six ships were lost due to a windstorm, spurring the demand for the lighthouse, which was built in 1909. For a listing of upcoming events at the park, click here.